Chocolate and zucchini is a wonderful combination. I have tried this combo in the chocolate zucchini bread and chocolate zucchini cake recipe. I had some leftover zucchini after I made a huge batch of curried zucchini soup. That’s when I got this idea of using shredded zucchini instead of apples in this vegan cocoa apple cake recipe. The result was delicious and moist cupcakes. Throw in some vegan chocolate chips to make it even more “chocolaty”. 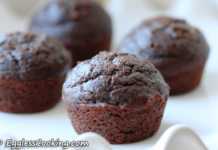 Moist and delicious, these chocolate zucchini cupcakes are very easy to bake with readily available ingredients. Preheat oven to 350F/180C for 15 minutes. Line a 12 cup muffin tin with paper liners or lightly grease it with non-stick cooking spray. In a liquid measuring mug combine together the milk and vinegar. Let is stand for about 5 minutes or until it curdles. In a large bowl stir together the measured dry ingredients and make a well. Now add the curdled milk mixture and the rest of the wet ingredients one by one and stir until just combined. Fold in the shredded zucchini too. 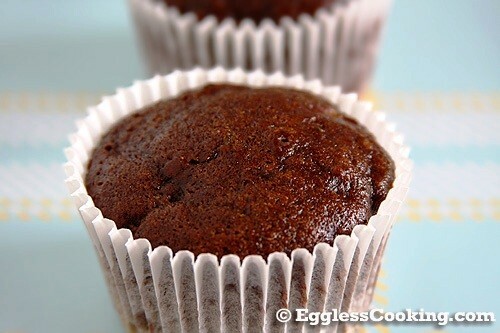 Divide the batter among 12 cavities of the prepared muffin tin and bake for about 15-20 minutes or until the toothpick inserted in the center of the cupcake comes out clean. Mine was done after 16 minutes itself. Remove the pan from the oven and cool it on a wire rack for about 5 minutes after which pop out the cupcakes from the tin. Cool it completely on the wire rack before you can frost it. 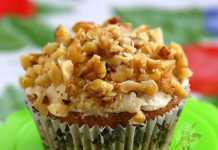 The whole wheat pastry flour I used in this cupcake recipe gave it a nutty flavor and texture. If you are looking to make this recipe for birthdays and special occasions like such, I would recommend using all purpose flour. Also you might want to increase the quantity of sugar by another 2-3 tablespoons if you are not going to frost it. We were fine with the 3/4th cup of sugar but people with sweet tooth might feel that the cupcakes are not sweet enough. This recipe can also be baked as an 8-inch round or square cake. The baking time would be about 25-30 minutes in that case. Grated apples, carrots and beets too can be used instead of the zucchini. I use Spectrum brand’s organic, expeller pressed and refined coconut oil. It does not have the coconut flavor and so does not make the baked goods smell and tasty “coconutty”. I have used unsweetened applesauce here as a fat substitute. Check my homemade applesauce recipe or use oil instead of that. Mashed banana is a good substitute too. Since we are just using 2 tablespoons, I’m sure that it’s not going to lend its flavor to the cake. Can I use qunioa flour instead of maida/whole wheat flour for any recipe?? Quinoa is gluten-free so you cannot substitute it measure to measure for maida/whole wheat flour, especially when you are baking egg-free too. 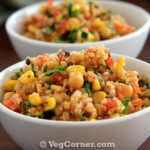 Try using a gluten-free mix which is readily available in most of the stores these days. You’re very welcome Pooja. Thanks for the feedback. I’m a vegetarian and not vegan. Can I use normal instead of rice milk. If yes, then is it okay to mix normal milk with vinegar in the recipe ? 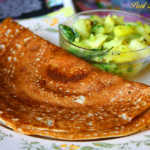 Yes you can use regular milk and also use vinegar or you can choose to use buttermilk instead. That’s what we are mimicking by using non-dairy milk and vinegar. Hi Can I use rice flour and just water for the wet ingredient instead? If so which quantities of each for this recipe? No it doesn’t work. You can use any other milk that you have in hand. Thanks so much for the great recipe!! I made it tonight as a square cake and added a simple chocolate glaze. It tasted amazing – my 7 year old doesn’t lie!! I also added mini chocolate chips. 🙂 I’ve added it to my recipe box and will make it again. Thanks for taking the time to share. Yummy and easy. 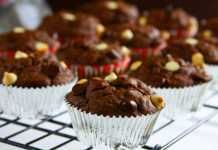 Substituted applesauce with pureed banana (out of applesauce) and added chopped walnuts and dairy free chocolate chips. That’s great. I’m glad everybody liked it. Hi, for the zucchini do you keep the juice and add this to the mix? Yes simply grate it and add it…don’t need to retain the water. I’m here because I just did a Google search to find a healthier alternative to the slice of chocolate-zucchini bread my husband just brought to me. It was an awesome bit of delicious, but I know it was made with all the wrong ingredients. So I came in search of a possible alternative recipe, more in style with my dietary needs at the moment. I will be making these cupcakes, thank you so much for sharing this recipe!! I wonder if herbs can be added to this recipe. Oh! do try it and I’m sure you will like it. What sort of herbs are we talking about? Just be sure that it doesn’t overpower the taste/flavor of the cupcakes. Absolutely delicious cupcakes. Very moist. Thanks for the recipe. I used regular milk, canola oil and grated green apple. Neither kids nor adults can feel the zucchini in this recipe or any other baking recipe for that matter. These cupcakes are SO moist and delicious! I made them for my son’s one year old birthday. Perfect recipe for little ones. I did modify it a little.. I used whole wheat flour (not pastry). Instead of sugar, I substituted 1/2 cup of maple syrup and subtracted 2 tablespoons of almond milk (before putting 1 TBL of vinegar with it) because the maple syrup makes it more moist. I made them with zucchini and served them with a no sugar added vegan frosting consisting of soaked cashews, pitted dates and a little bit of almond milk (blended until it was really creamy). They were a hit even with people that thought these cupcakes sounded “weird”. haha Gotta love it! A crowd pleaser.. oh and the cupcakes were perfectly sweet 🙂 Thanks for a great recipe. P.S. The batter was AMAZING! Your ideas are amazing Nicole. I too am going to try the vegan frosting. Thanks. Do you know how many grams of fat, protein, carbs and fiber are in each cupcake? I don’t know Steve. 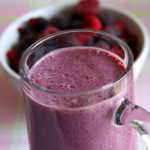 I have started including nutritional information for recipes recently. I think it’s going to take a while to do the same for older recipes. No worries Madhuram. Thanks for answering. I can figure it out on eTools on the WW site. I just need to take the time to enter all the ingredients. I love this recipe. 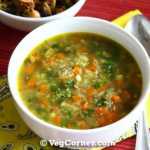 Have made many times trying it with rice, hemp or coconut milk and always comes out delicious. And I’ve tried with zucchini, carrot and beets. We like it with less sugar too. Great recipe! These are fantastic! I needed a recipe to accommodate a kid who has allergies to eggs, dairy, and nuts (including soy). This fit the bill. I did a trial run tonight, and they are de-lish! Since it will be a birthday party, I did use all-purpose flour and about a cup of sugar. Thank you for sharing this recipe – we will have a happy birthday party guest! They looks super moist and damn attractive.